Local hero Rupert Nongrum and new Cameroonian striker Aser Dipanda Dicka scored a goal each as Shillong Lajong FC celebrated their return to the JN Stadium in Shillong with a 2-1 victory over Minerva Punjab FC on Saturday. The first Hero I-League home match this season for the Reds also produced Lajong’s first victory of 2016-17 and pushed the North East club to provisional seventh position in the points table. Lajong started with as many as eight Under-22 players and only two foreigners – Dicka and Japanese midfielder Yuta Kinowaki – but came out of the dugout strongly as they looked to make the most of their home advantage. From around the 10th minute the first half belonged to the Reds, who were cheered on by thousands of fans. 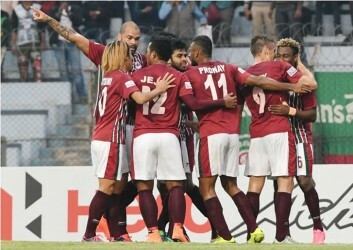 In the 17th minute Rupert secured his place in the history books with his first I-League goal by demonstrating that he has a fine football mind despite his years. He was later rewarded for a fine performance over 90 minutes with the Hero of the Match award. The midfielder met a well directed long ball with an outstretched right boot. Neatly collecting the ball, the youngster, who was totally unmarked, sped towards the edge of the opposition box and fired in a low strike that beat Minerva goalkeeper Arshdeep Singh. 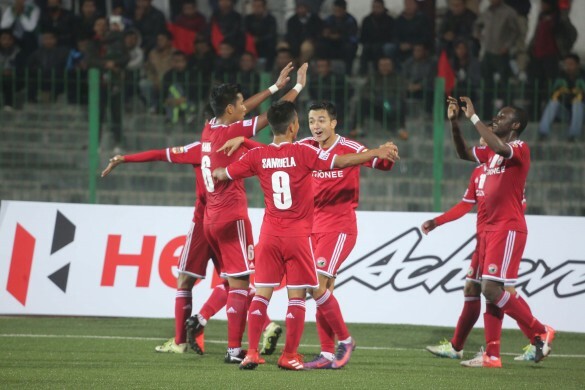 A little miscommunication between Dicka and captain Nim Dorjee Tamang saw Lajong miss a good chance to double the lead just five minutes later, but that really did not make much difference as the Reds continued to pile on the pressure, motivated by the cheers of the Lajong Faithfuls. A few minutes either side of the 30-minute mark Dicka had two headers just miss the mark, but he made good on this promising display to convert a chance 10 minutes later. Although the striker could not get to a long ball, Minerva’s defender Loveday Okechukwu failed to clear the ball after a bad bounce and the resulting skewed kick fell nicely into place for Dicka to walk the ball into the net with the goalkeeper out of position. The Punjab-based team’s coach made a couple of attacking substitutions at the start of the second half and Minerva saw much more of the ball, though Lajong faced up to the pressure and held off the marauding opposition. With full time in sight, Okechukwu made up for his first half mistake by firing in a scorcher of a ball that Lajong custodian Vishal Kaith could do nothing about to reduce the margin to just one goal. Incidentally, this was the first goal for Minerva in the I-League. Fellow foreign team mate Ivan Filatov then got another chance to score for his team, but his attempt from within the box was neatly gathered by Vishal, who had to dive to his right. With referee Raktim Saha soon blowing the whistle, Lajong could celebrate a much deserved victory and they will go into their next game, against Mumbai FC on January 28, with renewed confidence.